The title of this post, is the same as the title of an article in the April 2018 Edition of Modern Railways. 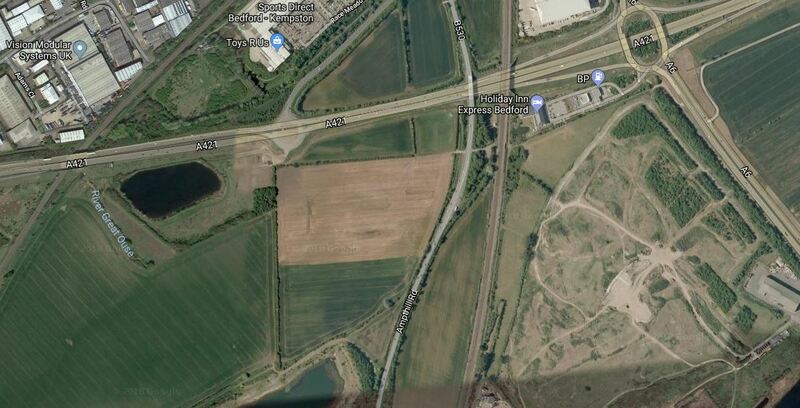 A new railway between Milton Keynes and Bedford for the East West Rail project has been suggested as a way of avoiding problems with the Marston Vale Line, where the hourly stopping service and numerous level crossings limit capacity for through regional trains. Another aim is that the next phase of the project should be completed by the end 2022, which is between a one and two years earlier than the existing target.The Chairman of the East West Rail Company, then said he’d like the the railway to open in 2027. The article says a new route will be expensive, but innovative ways of doing things could help. There are at least thirteen level crossings. New houses are being built near some stations. The operating speed is just 50 mph. Finding a new route at Fenny Stratford, Woburn Sands, Aspley Guise, Ridgmont and Lidlington could be difficult. The railway passes under the M1 and the A421, so moving these crossing points could be difficult. It’s all a complicated design problem. East West Rail could borrow a trick from the Heathrow Southern Railway, which is planned to run alongside the M25 to get to Heathrow. The new railway could be routed alongside the A421 in the Bedford area. This Google Map shows the A421 to the South of Bedford. The Marston Vale Line goes across the North West corner of the map. The Midland Main Line goes across the map in a North-South direction. The roundabout at the North East connects the A421 to the A6. The building by the roundabout is a hotel. If the East West Rail Link was routed alongside the by-pass a station could be built where the two lines cross. The Midland Main Line and Thameslink would be linked to the East West Rail Link. Passengers for Bedford would be able to use the frequent Thameslink service to get to the town. A big Park-and-Ride could be built. Marston Vale Line services would take the same route as they do now, via Bedford St. Johns station. If it was desired, chords could be built to enable services on the East West Rail Link to serve Bedford with a reverse in Bedford station. Oxford has a Parkway station, Milton Keynes has a Milton Keynes South station at Bletchley, Cambridge will probably have a Cambridge South station, so why shouldn’t Bedford have a Bedford South station?